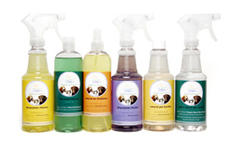 Organic Stain & Odor Remover is safe for both your pets and your family. Our natural enzyme action keeps working until all traces of the stain are eliminated. This product contains no harsh chemicals or odors. This spot remover will not harm carpets, rugs, upholstery or fabrics. Ingredients: A blend of enzymes, biocatalysts, organic surfactants and organic cleaning agents. This product does not contain Isopropyl Alcohol (IPA) found in most spot removers. Organic Stain & Odor Remover safely removes the toughest pet stains, including urine, feces, food, blood, vomit, drool, mildew and similar stains. Directions: Shake well before using. For best results: Spray directly on affected area, agitate area, blot with clean white terrycloth towel. After removal of stain, wipe clean with clean damp cloth. If stain is not completely gone in 48 hours, retreat stained area. For odors, pet accidents and others, pour liberally onto stain. Do not blot, allow to dry. Organic and Nature's Organic Stain & Odor Remover is a natural enzyme-based product and may take a little longer to completely remove upholstery stains. When treating upholstery, spray on an inconspicuous area to test color fastness.